Izabela Ruta is Technical Manager at the International Accounting Standards Board (IASB). 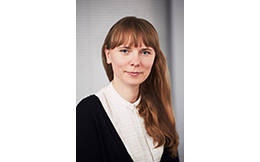 She is responsible for the development of the IFRS Taxonomy, mainly from the IFRS content perspective. She is also involved in the global outreach activities to promote understanding and adoption of IFRS Standards and the IFRS Taxonomy. Izabela has been working at the IASB for almost 8 years. Before joining the IFRS Taxonomy team, she was mainly involved in developing IFRS 17 Insurance Contracts.